You pour your heart out to lloyd in tweets, Facebook posts, emails, reviews, & your diary. You look for nothing in return, other than the gratification that lloyd himself reads every single one of your messages. That’s all you’ve ever needed: acknowledgement. But today (and for the next 6 days), your love letters & Valentine cards will not only earn you a special place in his heart, the best notes will be chosen for some pretty cool prizes. At EVERY truck stop from 2/7-2/13, you can bear your soul onto paper while we roll your burrito. We’ll provide the pen & paper at each truck, all you need to do is provide the words. 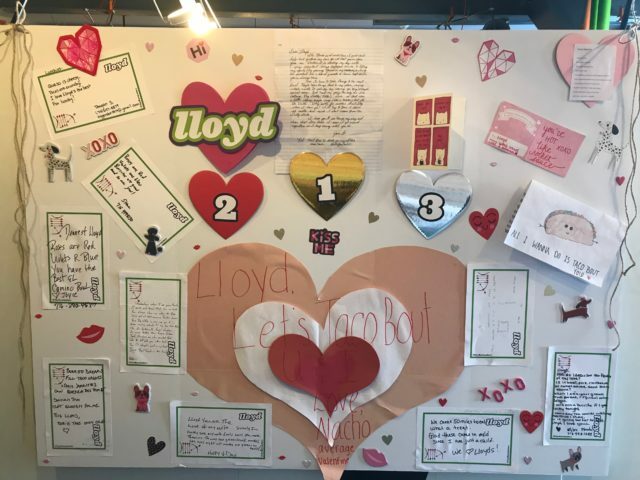 3rd place: lloyd swag bag!